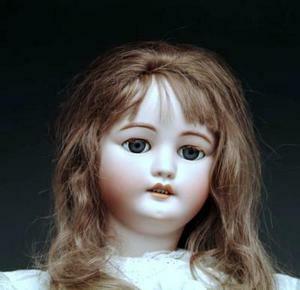 GERMAN DOLLS, along with antique French Dolls, are regarded by collectors as the most desirable. German porcelain dolls in particular, are known for their high quality and durability. They also usually fetch high prices at antiques auctions and most are clearly marked with makers marks for identifying and determining their age. For help on that, please see our Antiques Price Guides and Porcelain & Pottery Marks Guides. Most early German Dolls were made in Bisque, i.e. fired only once and had no glaze. The vast majority of these were manufactured ca mid-to-late 19thC, from 1840 to 1880s. After that time, and although Bisque Dolls were still being produced at an appreciable level, most porcelain dolls were glazed and had a smoother surface. These dolls are specifically referred to as China Dolls by serious collectors, but this term is sometimes used generically for all Porcelain Dolls in general. The peak of production for porcelain dolls in Germany occurred in the period between 1890s to 1930s. Armand Marseille with Ernst Heubach, which although did not last long, provided for an influx of high quality porcelain dolls ca early to mid 20thC, most of which still survive to this day as grandma's dolls or for some of the oldest amongst us, our very own strong reminders of a precious childhood. The vast popularity of Porcelain Dolls world-wide also prompted interesting rivalries and competition. A characteristic instance of this rivalry was the introduction of Fashion Dolls in France, which were meant to be in direct contrast to the now mostly mass-produced German dolls. These Fashion Dolls are particularly pretty, partly because in addition to their usually more feminine or baby-like facial features, their bodies were also made in fairly accurate human proportions and were adorned with the cutest and most detailed dresses & dolls clothing. Most often, this clothing was interchangeable, which sparked an even larger market for Dolls Clothing & Accessories or little-tiny Doll Uniforms, snapped by any child whose family could afford them. Jumeau Dolls are amongst the most famous makers of Fashion Dolls in France and according to some historians, it is said that their Paris factory was set up as a deliberate attempt to compete with German Porcelain Dolls, especially those manufactured in the ever increasing "German industrial complex" in the region of Saxony. Needless to say, as porcelain dolls became more and more affordable and demand surged to new heights with the emergence of the Middle Class in the US & Europe after WWII, new entrants in doll manufacturing, especially from Japan, eventually replaced most German (or French) makers in the market, many of whom soon closed. Because of this shift in the supply of dolls, along with the introduction of dolls made of totally different materials (plastic, celluloid etc), antique German Porcelain Dolls nowadays remain high in the minds of avid doll collectors and are almost always the most sought after at auction or antiques fairs.